Alzheimer’s disease and dementia affect almost 50 million people worldwide, with a case every three seconds. A new method could lead to earlier detection of the disease and better outcomes for patients. Dementia affects more than 425,000 people in Australia, and that number is projected to rise to more than 1,000,000 by 2056. Alzheimer’s disease accounts for 50 to 75 per cent of these cases, and it is one of the leading causes of death for people aged 65 and older. The effects of dementia are tremendous as well, not just medically and socially but economically – in 2018 the estimated cost is $15 billion. An early and correct diagnosis is important to receive proper treatment, but there is yet to be a definitive test for diagnosing Alzheimer’s disease, or any of the other common types of dementia. However, technology being developed by researchers from the Universidad Politecnica de Madrid (UPM) in Spain could help increase the rate of early diagnoses in a non-invasive way. The team of biomedical engineers and technologists has designed a new contrast agent for magnetic resonance imaging (MRI) that can help detect the early signs of Alzheimer’s disease. The contrast agent is a biomarker that indicates high concentrations of certain compounds in the brain associated with Alzheimer’s disease. This includes the build-up of the iron-storing protein ferritin and amyloid plaques – both characteristics of the disease. 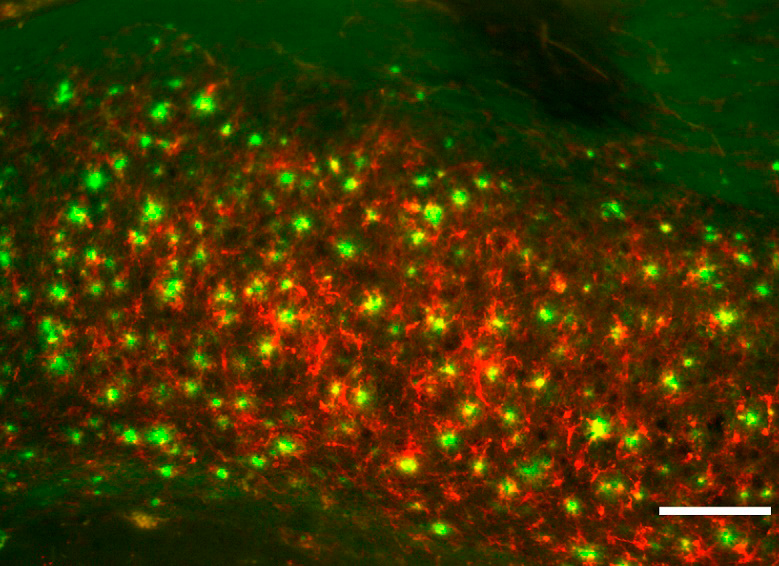 Brain section of a transgenic mouse showing accumulations of amyloid plaques (green) and ferritin (red). Other MRI techniques can successfully detect these deposits, but only in the high concentrations that come with advanced cases. To be able to use MRIs for early detection, the team researchers needed to develop a new contrast agent sensitive enough to detect these accumulations at lower levels. To create the contrast agent, the researchers studied accumulations of ferritin in the hippocampus region of the brains of transgenic mice. What they found was ferritin clustered around amyloid plaques, which are a tell-tale sign of Alzheimer’s disease. This finding, published in the journal Chemical Neuroscience, inspired the researchers to develop a contrast agent for MRIs containing magnetic particles with antibodies that recognise and bond with ferritin. “The accumulation of functionalised nanoparticles in the specific area cause a significant resonance,” said lead researcher Dr Milagros Ramos. Currently the only definitive way to diagnose Alzheimer’s disease is to analyse the brain of a patient post-mortem. This work could pave the way towards earlier and more accurate diagnosis of the condition, and better prognoses for the millions of developing cases around the world.